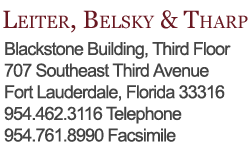 Leiter, Belsky & Tharp is an defense-oriented civil litigation firm with AV® rated attorneys. We provide result-oriented and cost-effective legal counsel and services to insurance companies, their insureds, privately-held companies, self-insured companies and individuals. We pride ourselves on our dedication and close working relationships with our clients and providing services to meet each client’s specific needs. YOUR DECISION TO HIRE A LAWYER IS IMPORTANT AND SHOULD NOT BE BASED ON ADVERTISEMENTS. Before hiring a lawyer, please request more information from us regarding our qualifications and experience at no cost or obligation to you. Please feel free to contact us if a legal matter arises. We may be able to assist you.